A variety of print media will be covered in this class. Personal interests and approaches to working will dictate the direction and speciﬁcs of the techniquesoffered in this instruction. Learn to use drawn and photo-copied images in Polyester (Pronto) Plate & Paper Lithography, try drypoint on plexiglas printed with chine collé, collagraphs with carborundum, or the newer solarplate etching, or silkscreen. Be encouraged to experiment and create hand-pulled original prints. Time: Friday 10 am. – 1 pm. Call and/or e-mail for further details. 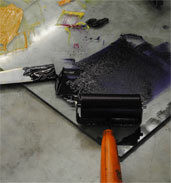 shall operate a multi-media studio dedicated to the art of the print. Its purpose is to support, promote, educate and advance the art of original printing, including traditional and innovative printmaking. Download our current schedule of classes here. Midcoast Printmakers, Inc. is a non profit 501(c)(3) organization devoted to instruction and encouragement of hand printmaking. This website was funded in part by a grant from the Maine Arts Commission, an independent state agency supported by the National Endowment for the Arts.